A few weeks ago, Lynn’s Weigh was part of the international Blog Your Heart Out Day to raise awareness of women’s heart health (see “Lady In Red, Do You Know Your Numbers?”) I was so encouraged to hear from many of you who either knew your numbers or went straight to your doctor and had a blood draw (that wasn’t so bad, was it?). Knowledge is power! Knowing your numbers can help keep your fitness goals on track. So can the very spiffy fitbook™ (with a little “f”). Leading the BYHO campaign is Angela Manzanares, founder of fitlosophy, inc., which makes the fitbook™. Angela asked if I’d take a look at the fitbook and if I liked it, give one away to one of Lynn’s Weigh’s readers. Why I love fitbook™ so much is because it is exactly the kind of tool that fits with my own philosophy that journaling is key to weight loss and maintenance. You know I’m always harping at you about journaling: journaling thoughts and feelings about weight, journaling food intake, journaling exercise strategies and goals. Turns out I’m right! Research suggests that people who write down their goals are 75 percent more likely to achieve them. Because there was no fitbook™ when I was starting out (and yes, I walked uphill both ways through the snow to school, too), I used blank journals, Word, a homemade spreadsheet, bar napkins, whatever it took to record my daily feelings/food/exercise. It’s compact so you can take it with you to the gym, and its vinyl cover cleans up easily. fitbook™ also comes with a pen, and there’s a pouch in the back to hold your membership card and/or $$ for an after workout smoothie (no trips to DQ!). The fitbook™ costs $19.95 each or 4 for $75.95. The fitlosophy site also offers an e-newsletter and fitness tips through its website. If you’d like to win a fitbook™, leave a comment or send me an email at lynnbering@verizon.net and tell me a little about your journaling efforts or intentions. I’ll announce a random winner on Friday! Keep in mind, heart disease is the #1 killer of women. To learn more, go to Go Red For Women. I joined the site and found a ton of great info about heart health. 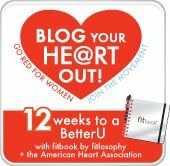 If you’re on Facebook, become a fan by clicking Go Red For Women Fan Page. And while you’re on FB, become a “fan” of Lynn’s Weigh! Click here to join our conversation. To read fitlosophy’s press release about BYHO and learn more about the American Heart Association’s 12-week fitness and nutrition plan, click here. See ya’ll on Friday! Good luck! This entry was posted in Uncategorized on March 3, 2010 by Lynn Haraldson. I recently posted about switching to a pencil to paper workout calendar instead of online tracking. Really enjoying the old fashioned way! This would be awesome! I have to admit i love to journal and when i'm journaling it is much easier to stay on course with my eating and workouts. Usually i journal in whatever notebook is nearby. The Fitbook looks awesome, and i'd have all info in one place! I would love to win one. What a great concept! I usually do my tracking online, but how nice would it be to have a book to keep in my purse! I have tracked online as well as in a WW 3 month tracker. I think I like the paper tracker better. It can be more convienent and I don't get caught up online (another addiction to overcome?) I have looked at the fitbook online before and thought is would be a great “fit”! I go in spurts with my journaling. Right now I'm struggling. This looks like a great option to combine gym workouts along with food intake. Great idea and it sure it cute! Lynn, I have kept a journal for about 10 years. It is mostly in word and now on my blog. I think I would love to keep a journal in the car or take one on walks because so often that is where inspiration strikes. I mostly journal on Fitday.com and have pretty good luck with it. I used to do regular journals til my daughter-in-law was reading some of my mothers writing after she passed and I realized I didn't want anyone reading the angst I was putting in my private journals. Love your inspiration. Martha W.
That's a very cute journal, but I'm going to pull a POD here and say don't enter me for it because I know I wouldn't use it enough…I am too attached to journaling via my blog and myfitnesspal.com for my food. I've noticed that whenever I journal my food regularly, I lose weight – how nifty is that! This fitbook looks pretty cool – i've never journaled my fitness efforts, but it looks like a great idea. I currently use the franklin covey day planner for feelings and the WW 3 month journal for food & exercise. I would love to have a journal for it all in one place. Online tracking doesn't work for me. I use a daily journal daytimer kind of calendar, but its a bit bulky to carry around with me all the time. I journal my food and exercise as well as blood sugar readings every day. Even on a bad day I journal! I love looking back at them for meal ideas or motivation. I also log my weigh ins. If I didn't journal every day I would have given up long ago because I'd have no idea how far I've come. You know I am a major journaler. But for fitness journaling, I have to admit that I haven't ever had such a nice journal. Usually those little W.W. booklets, or scraps of paper on my refrigerator. This would be so fun to have. I am a journal freak! I even use my iTouch to keep track of things. 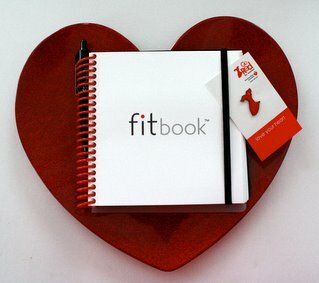 The Fitbook looks so very awesome!! You know, that is one thing I learned really quickly when trying to lose weight. You may think you know what you're eating, how much, etc, but you don't know for sure until you write it down. I don't think I could even manage it without my trusty little notebook. Lol! for me, journaling and keeping a food diary has been a must. It's also fun to go back to see what I ate months ago!! It's kept me on track and I even take my journal when I go away for a day or two. i've never been good at keeping any kind of diary. I start for a few days, then quit. I have started again using a composition notebook, but so far it's just food and exercise. Very minimal. I would love to try this fitbook and see if it is motivating for me. I like many things about this journal from Fitbook. I just re-joined WW and use their 3 Month Journal but really in my opinion this is just for food tracking. Please count me in for the giveaway! Daily writing about my food/excersize plan keeps me accountable. I write in a regular notebook so I would love to have a fitbook! I love it because it is “square” just like my personality! However, I also know that in order to be successful at keeping the weight off I must stay “present” and be aware of what is going down the chute and hopefully staying off the thighs. Thanks for your blog, living in England, your blog helps me feel like I am still close to the good old USA! Journaling is such a great tool for anyone on a weight loss plan! I always feel so much more organized and empowered when I can clearly see my goals set out in front of me on paper – or in a book, in this case! well i guess this as good a time as any to stop lurking! my journaling efforts are well….sad. i tried just a notebook and i have tried printed pages from various sites. nothing keeps with me. I have also done online sites. but then there are days at a time i just don't want to get online. I joined a weight loss group and the ones who lose are the ones who write. I just can't mseem to catch the writing bug!i am sure it would help me. i looked at the sample format and it looks really helpful! feel free to email me with any journaling inp;ut you have……maybe you will be my aha! moment. Journaling is definitely one of the keys to my success so far. I've lost 90 lbs in the last 28 months and I keep track of all my points and activity on Weight Watchers e-tools. I've found out the hard way in the past that if I don't journal, then I'm not successful. As much as I love e-tools, I'd also like to have a paper journal that's easily portable for when I'm not near my computer. This book looks fantastic. Right now I am journaling in a regular old spiral school type notebook. I need to be a more consistent journal girl. I seem to journal every detail, burn out, take a break, and then resume the journaling. It is so good for me when I am consistent with it though. I would love to win this! I am now using a day planner from the dollar-tree! I have written down everything I have eaten since I started WW in Sept. '07. I will write gym, or yoga on the day that I do that, but I have never recorded emotions, thoughts, goals, etc. before. I have thought numerous times that I need to do that because I am still an emotional eater and need to fix that. I would love to win the fitjournal so I can do more extensive journaling. Either way, I am going to do it. I would love the fitbook! I currently journal and track calories/fitness at SparkPeople, but don't always have access to a computer, so the journal would come in handy. Thanks for the chance to win one! Something from a Stephen King novel. Trying to live a fit life loving food, cycling, gardening and everything in between!